How do you pronounce CYA? The Coalition with Young Adults began through conversations in 2006 at a convocation of women religious in Northeast Ohio. These conversations evolved into a working group focused on engaging Catholic young adults. This working group included women religious, campus ministers, young adult leaders, and the Youth and Young Adult Ministry Office of the Diocese of Cleveland. In 2009, this working group surveyed young adults and ministries and created a strategic plan for supporting growth in service opportunities, retreats, events, and intentional communities for young adults. As a network of volunteers, CYA formed an advisory board in 2012 and hired their first full-time staff person in 2016. Why haven't I heard of CYA before? We work behind the scenes, promoting the many wonderful young adult ministries and initiatives in Northeast Ohio. After all, it is not our goal to promote CYA, but to promote events like Theology on Tap and ministries like Leadership for a New Day, Young Catholic Professionals, the Ite Project and more. At the moment, CYA is not a 501(c)3. However, our fiscal sponsor is the Sisters of Notre Dame, and they are a 501c3 non-profit organizations. Tax-deductible donations can be made to CYA through the Sisters of Notre Dame. Do you work for the Diocese of Cleveland? We collaborate with the Diocese of Cleveland often to serve young adult ministries, but we also collaborate with the Religious Orders based in Northeast Ohio and with the Diocese of Youngstown. We are not funded through the Diocese or Catholic Charities, but rather through grants and donations. That said, the Youth & Young Adult Ministry office of the Diocese of Cleveland was one of the key founders of CYA back in the late 2000s and continues to be an invaluable collaborative partner. How can I get more involved with CYA? Pray about your gifts and talents and how God may be calling you to apply them...then email us at coalitionyoungadults@gmail.com and let us know how you would like to get involved! CYA is funded through a generous grant from the Sisters of Charity Foundation of Cleveland and through donations from individuals who want to see young adult ministry thrive. What do you mean CYA is a network? 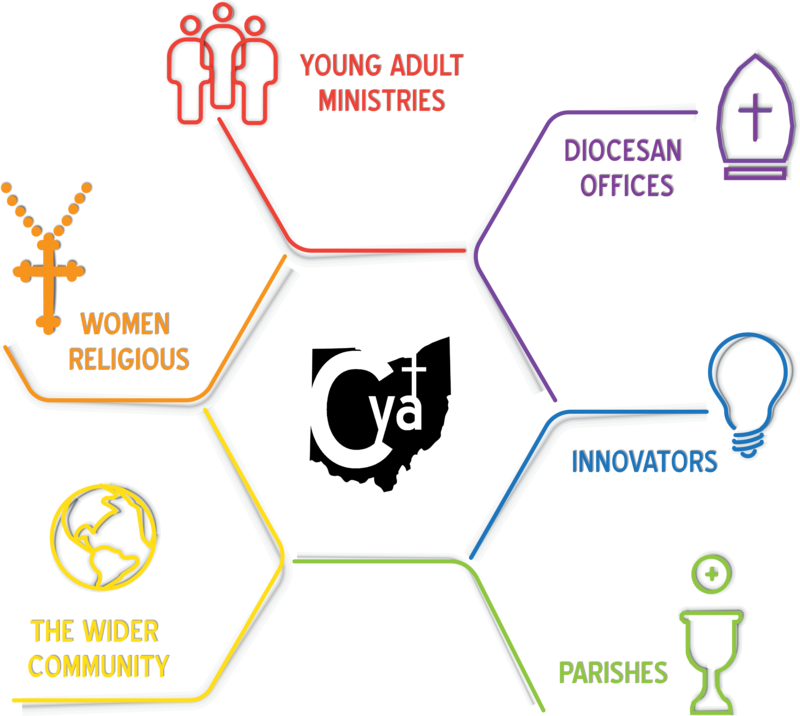 CYA connects young adults and young adult ministries with each other as well as with: religious communities, parishes, diocesan offices, innovators, and the wider community. We are not a group or a program or a membership organization. So, the best way to describe Coalition with Young Adults is as a network. If you have any questions or ideas for collaboration, don't hesitate to contact us.